Is trend of the year 2015. Leather can be a garment or accessories not only for events or night dress, but also street style recommended as a touch of elegance and distinguished clothes. Leather in garments or accessories are the new look at street style. It is such a look that changes the classic jeans for using the leather instead. So that is the new look like, so sophisticated and useful in every moment of the day. Leather boots high, boots, and heels leather pants-tight, leather dresses, long coats covered with openwork. The leather and skin take center stage for the street style or night. Coexist overalls, coats, dresses and knitwear, with leather and skins. The texture that brings such glamour and also as a synonymous of luxury and elegance must be used with a criterion. The ideal is not to abuse this texture but use it as a garment or accessory independently each other. Besides the classic black leather coat or coffee, trend look like skin and leather handbags, gloves, hats, and dresses in different colors, pastels, animal print, fretwork. These skins can be natural or synthetic. Technological resources have made ​​it possible for synthetic skins look like natural imperceptibly. The layer type leather coats stand as a trend, tight leather pants, skirts in A, tubular skirts, etc. Are all made on leather that is the new trend set. Dresses designs in leather such as Balenciaga, Valentino, Versace with dresses drafts. 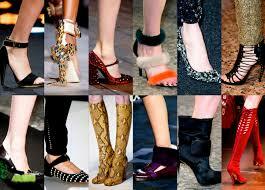 The designers also turn to the skin in footwear in general. The main idea is to be as personal as possible within the fashion world. The are different kinds and qualities on leather: antelope, goat, sheep, calf. Those pieces of leather comes from a small animal, so the price is so high because on a garment you need more than one leather. It can also be mixed calf leather with antelope, or goat. Manipulated creating colors and textures. These textures could make the effect of an animal, or any other effect could be possible. As I said before fashion houses as Balenciaga, Gucci, and Versace are focus on that impacted trend. The impact is so interesting because the leather can be used as a fabric as well. As I said before fashion houses like Balenciaga, Gucci, Versace has focused on the shocking trend. Is interesting because the leather can be used as a fabric also. So there is not limit to the designers, who can to create what ever they want. Because leather well done has possibilities to been manufactured as a fabric. Details on the leather can do possible to recreate a dress shapes, as pockets, forms of collars, sleeves, closures of motoqueras as jackets for young people. The antelope is the most malleable leather on blouses, also can be pierced by hand or laser. The antelope can be combined with the goat in different cuts and details recreating a luxury garment. The accessories also do a touch of distinction. Shoes, gloves, bags, all of them can be mixed with skins as neonate with hair for example. Also the ability to color to the skin or leather does the difference on the result of wearing apparel. The trend in the use of leather and skins naturally or not, does a benefit for women who bring elegance and distinction on style.